There are 150 rhymes in this collection, from countries all over the English-speaking world, including Great Britain, USA, Canada, Australia, New Zealand, Ghana, South Africa and the Caribbean. This comprehensive collection contains all the best-loved nursery rhymes, but also some new discoveries, and vibrant rhymes from Native American, First Nation, Inuit and Maori cultures. Each double-page spread is illustrated by a different artist, who has donated his or her work to the Collection or Archive at Seven Stories, Britain's National Centre for Children's Books. With 76 featured artists, this is a star-studded roll call of international award-winners and world-class bestselling illustrators, as well as young emerging talent from England, Scotland, Wales, Ireland, USA, Canada, Australia, New Zealand, Jamaica, Ghana and South Africa. 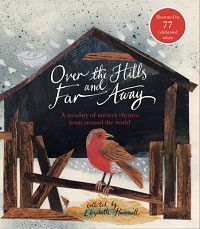 ELIZABETH HAMMILL is the initiator and co-founder of Seven Stories, National Centre for Children's Books - Britain's first museum celebrating and collecting the UK's children literature. As Artistic and Collections Director, she laid the foundations for the centre's novel approach to exhibition design and interpretation in seven ground-breaking shows and for its unique and growing collection of original papers, artwork and books by modern British writers and illustrators for children. She drew on her earlier experiences as a primary teacher in New York City, a book-loving mother of two sons, and a nationally recognised children's bookseller in Newcastle upon Tyne, first at the independent Bookhouse and then Waterstone's. Elizabeth was a founder of the Northern Children's Book Festival. She has lectured at Newcastle University, and she has judged local and national book prizes including the Smarties Award, the Whitbread Prize and the Marsh Award. She also edited a unique literary magazine In brief:by teenagers for teenagers (1989-1998) and has reviewed and written features for many of the top children's literature journals in the UK. Elizabeth was awarded an honorary Doctorate by Newcastle University in 2006, an honorary OBE in 2007, and an Alumnae Achievement Award by her American alma mater Mount Holyoke College in 2009 for her services to children's literature. Elizabeth continues to write articles and chapters and is currently a Founder Patron and Collection Trustee at Seven Stories. She and her husband live in Newcastle upon Tyne. They delight in being grandparents to Joshua, aged three, and are book, music and theatre lovers.